Map of central Leicester. The dotted line shows the line of the medieval town walls. Leicester Castle is in the city of the same name in the English county of Leicestershire. The complex is situated in the west of Leicester City Centre, between Saint Nicholas Circle to the north and De Montfort University to the south. A large motte and the Great Hall are the two substantial remains of what was once a large defensive structure. The hall is now encased in a Queen Anne style frontage. Leicester Castle was part of the medieval town defences, built over the Roman town walls. According to Leicester Museums, the castle was probably built around 1070 (soon after the Norman Conquest in 1066) under the governorship of Hugh de Grantmesnil. The remains now consist of a mound, along with ruins. Originally the mound was 40 ft (12.2 m) high. Kings sometimes stayed at the castle (Edward I in 1300, and Edward II in 1310 and 1311), and John of Gaunt and his second wife Constance of Castile both died here in 1399 and 1394 respectively. Eventually, however, it was used mainly as a courthouse (sessions being held in the Great Hall), rather than a residence. Apart from being used for Assize Courts (J. M. Barrie visited regularly and spent many hours inside as reporter for a newspaper when the hall was used as a court house), the Great Hall was also used for sessions of the Parliament of England most notably the Parliament of Bats in 1426, when the conditions in London were not suitable. It is also known for its connections with the Plantagenet family. The Castle, the Turret Gateway, the Great Hall and "John of Gaunt's Cellar" (erroneously called a dungeon) are all scheduled monuments, and are variously listed buildings also. St Mary de Castro is a Grade I listed building. 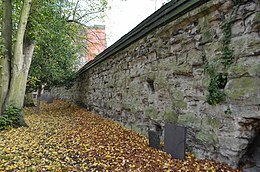 A section of the castle wall, adjacent to the Turret Gateway, has gun loops (holes) that were poked through the medieval wall to use as firing ports by the city's residents when Parliamentarian Leicester was besieged, captured, and ransacked, during the English civil war by the main Royalist Field army under King Charles I of England and Prince Rupert on 31st May 1645. The third storey of the Turret Gateway (erroneously known as 'Prince Rupert's gateway') was destroyed in an election riot in 1832. Castle Gardens, a set of gardens along the bank of the canal (there are official British Waterways secure overnight moorings for visiting boaters). The Great Hall, built in about 1150 by Robert de Bossu, 2nd Earl of Leicester. It was extensively rebuilt and the roof structure replaced in about 1523. The brick frontage dates from 1695. It was used as a law court from the earliest times until 1992. Castle Yard, the open area between the Great Hall and St Mary de Castro, which was used for public executions. A nearby plaque records that John Wesley addressed "a great crowd" here in 1770. The Turret Gateway (erroneously called 'Prince Rupert's gateway'). Leicester Castle and The Newarke precinct, showing the Motte and bailey (green), boundary walls of The Newarke (blue), and the southern side of the town wall (red). ^ Creighton, O.H. (2002). Castles and landscapes : power, community and fortification in Medieval England (Pbk. ed.). London: Equinox. p. 143. ISBN 978-1-904768-67-8. ^ "A History of Leicester Castle: The First Castle". Leicester City Council. 2013. Archived from the original on 2 July 2013. Retrieved 4 December 2013. ^ Simmons, Jack (1974). Leicester Past and Present: Vol. I. ; Ancient Borough to 1860. London: Eyre Methuen. ^ "Leicester Castle and the Magazine Gateway". Leicester City Council. 2013. Retrieved 4 December 2013. ^ "Turret Gateway: Description of the Ancient Monument". Leicester City Council. 2013. Archived from the original on 22 February 2011. Retrieved 4 December 2013. Fox, Levi (1941–42). "Leicester Castle" (PDF). Transactions of the Leicestershire Archaeological and Historical Society. 22: 127–170. Wikimedia Commons has media related to Leicester Castle.